Since it’s Friday, I decided to post a fun picture. This Lego giraffe made me giggle when I saw it. This photo was taken in Berlin, Germany. Happy Friday and have a wonderful and safe weekend! This entry was posted in Travel Photos and tagged 50 Year Project, Berlin, Fun, Germany, Giraffes, Humor, Lego, Life, Photography, Travel, Travel Blog, Travel Journal, Travel Photo. Bookmark the permalink. If you like that, you should go to Legoland here in San Diego!! The things you can build with legos…it’s nuts. That’s a lot of Legoes. Yes. I would love to know how many pieces exactly. Aw, how awesome is this! I didn’t know they have a lego giraffe in berlin! Was there a special occasion? Not to my knowledge. There was a Legoland near so I wonder if it’s always there. 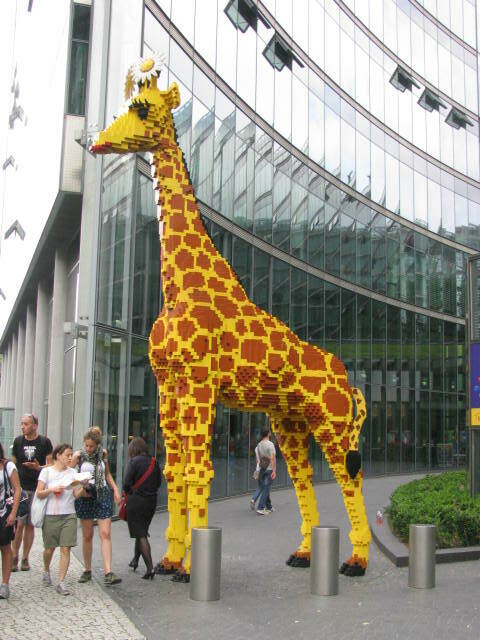 This is a very big giraffe made from Lego pieces! Yes it is! I loved it! Can I help you build it?! The people look unfazed by the giant giraffe towering over them. Love this. It’s like it’s completely normal to walk by a huge Lego construction. Maybe they are locals, but I also noticed that they didn’t care one bit. I’m always amazed at Lego constructions. I was a Lego fanatic when I was little. I would love to build something like this. However, I think it would cost a small fortune to buy all of the pieces. I wonder if they counted all of the pieces. WOW – it’s amazing what can be built with Legos! Such creativity. I would love to know how long it took. What fun! I used to play with Legos as a kid, but this takes it to a whole different level! Thanks Paula and congrats on all of the awards! Thanks very much! And congrats on your award! Glad to hear it! Ours was great, thanks for asking. I just took a picture of a giraffe in Legoland California this week! Yours is much more colorful, though–they used lighter-colored Legos back here. It’s amazing what they can make with those things. Great photo! I was in Berlin one year (several years ago) the same year of the World Cup. I remember that the Brandenburg gate was under construction – they had cloaked it in protective sheeting on which each pillar appeared to be wearing a soccer sock! It was great. Seems the sense of humor continues. That would have been cool to see. I love cities with a sense of humor. When I was there this summer I was amazed by how many places were under construction. I was bummed not to see them without scaffolding, but I’m glad they are being taken care of. That is a good question. It reminds me a little of Seurat and his pointillism to show the monotony of the working class.